She likes to use this deck of cards which features a different wildflower on every card. That way, everyone can learn about wildflowers while they play. Hey, is four aces a good hand? 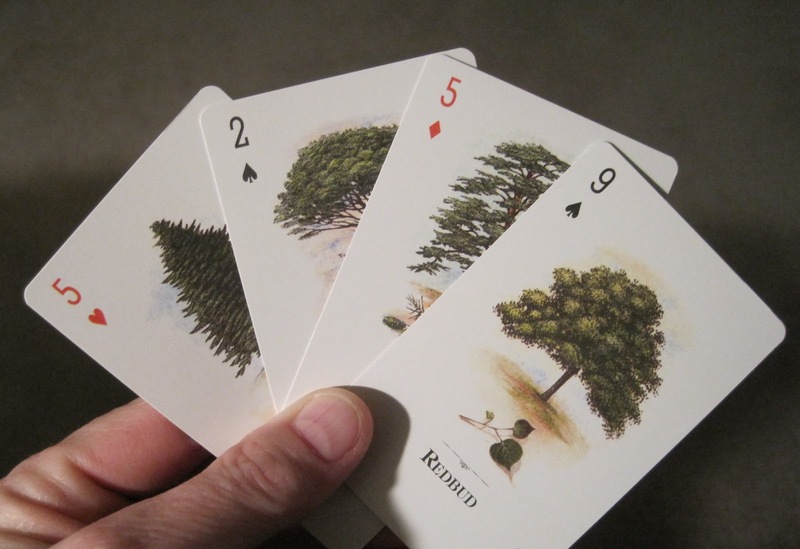 Later, she switches to these cards with different trees on all of them. This doesn't look like a very good hand but maybe the numbers have some other meaning? she is reminded that she hasn't ordered her seeds yet and January is almost half over. She tries not to panic and puts on her best poker face and acts real cool and nonchalant when anyone asks her if she has purchased her seeds yet. But instead of ordering seeds, she spends time searching online to find card games with a garden theme and finds games named Frog, Tractor, and Dig a Hole, which are sort of garden-y but not really. Then she looks at the cards in her hand and thinks about how the spades are for digging, the clubs look like clover leaves, the hearts remind her that she loves gardening, and the diamonds would only be useful if she could sell them off to buy more plants. 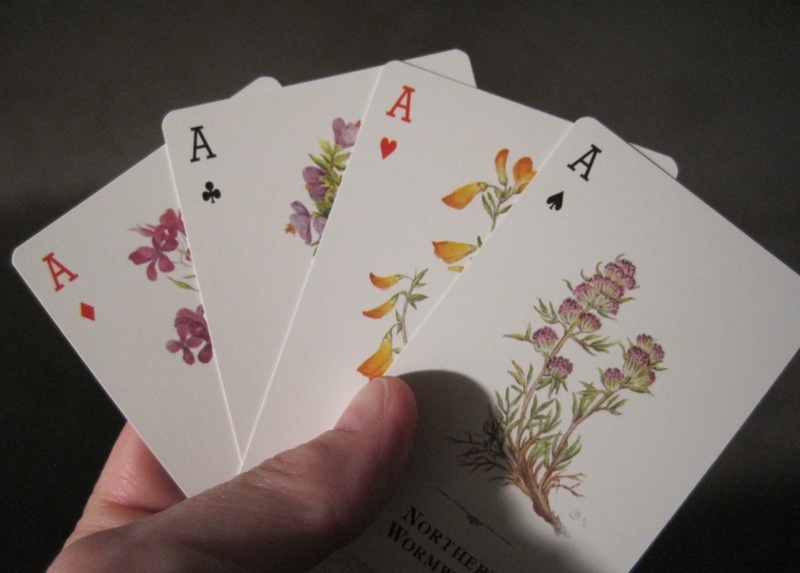 Finally, when a gardener plays cards, she also remembers that the same advice that applies to playing poker, also applies to gardening. Wow - flash cards for gardeners, what a concept! Whenever I play cards, I usually get the worst hands. At least I could look at something interesting this way when I have a hand full of 9's and 10's in euchre:) What I really want to know is where did you find these?? What fun. I have never come across these and I am a BIG bridge player. I once bought some historical cards and they certainly are confusing to look at. The less distraction the better. Now if the back of the card just had the flowers on I would be OK. The diamonds remind me of raised planting beds. Those are so beautiful playing cards. 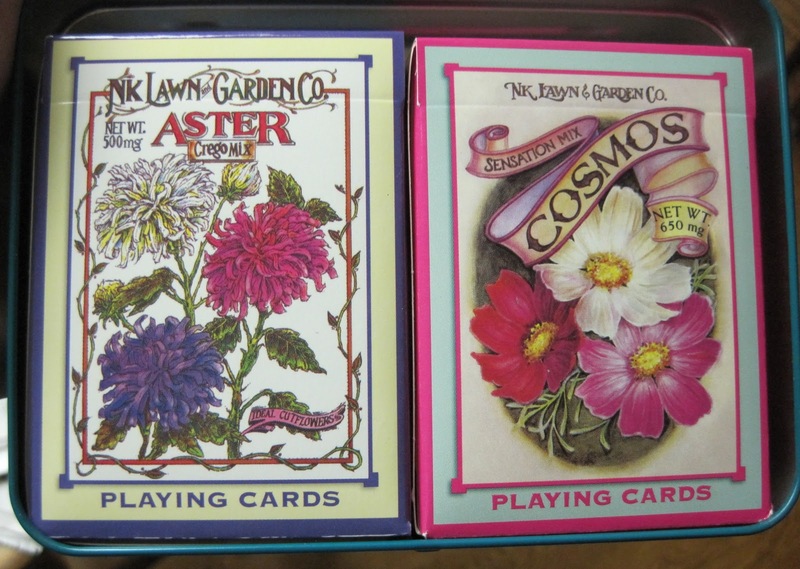 I love the garden cards. Where were you able to find them? I really would like to know. My family would get a "kick" out of them, knowing how much I love plants. Ramona, I've had these cards for a long time. I think I got them from Lee Valley but they don't seem to carry them anymore. Haha - great post! Those cards look so lovely. I think I'd be distracted from the game just looking at the photos on the cards. I love those cards. Front and back. I am going to keep my eyes open. Lovely cards, and a fun, whimsical post. If you find another source for the cards, please post it.